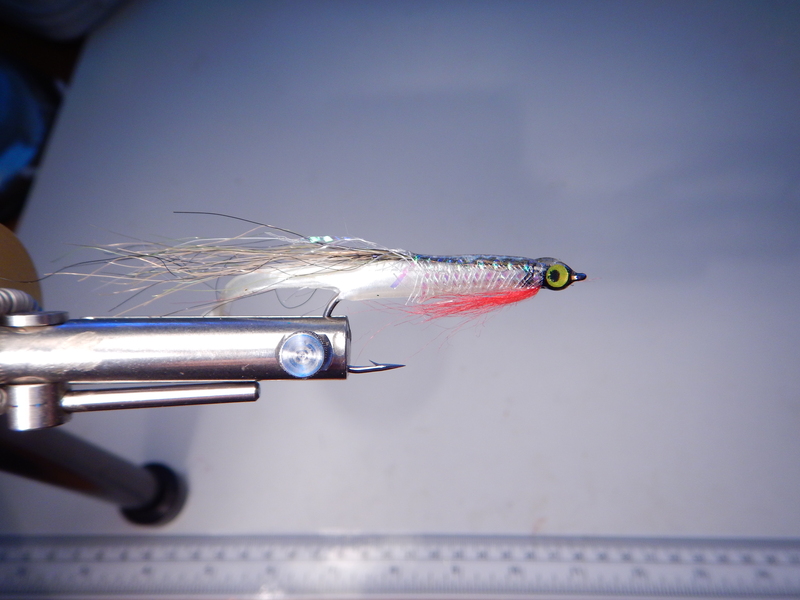 Earlier in the year when researching an article on the how fish use their lateral lines as a sixth sense (https://activeanglingnz.com/2017/01/03/the-lateral-line-a-fishs-sixth-sense/) it slowly dawned on me that building movement into fly designs was absolutely critical as fish use their lateral line to locate a fly or lure based on the pressure waves that it emits and only use their eyes to locate the target immediately before inhaling. 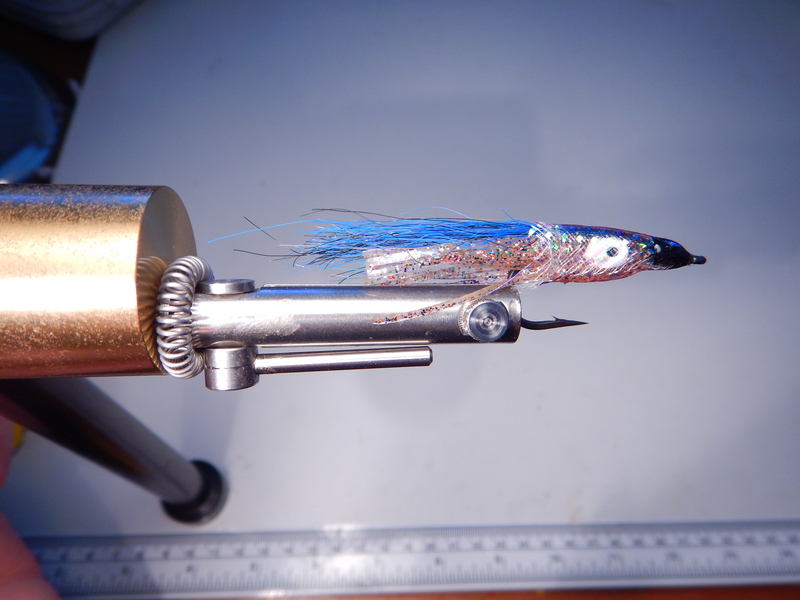 Get the pressure wave frequency right and the fish will find the fly, even in murky water. This meant that the fly needed a mobile component and a visual component that locked fish in once the fly was sighted. The next step was to find materials that provided movement and realism. For mobility I selected small rubber paddle tails (e.g. Eddystone eels, Redgill’s and Delta’s) or tiny squid skirts. For the visual “lock in”, Mylar tube slid over a small pinch of Enrico Puglisi Gamechange fibre positioned on top of the rubber body and coated with UV epoxy looked incredibly realistic. The UV epoxy penetrated the Mylar tube and reflected the light back through the Mylar making the body shimmer and dazzle. The wider the Mylar filaments in the tube the more realistic the effect. The good news is that the principle worked. Not just in New Zealand but in Singapore where a group of talented anglers fishing with tiny baitcasting reels using the BFS technique (Baitcasting Finesse Systems) adapted the hybrid flies to suit their conditions and began to have remarkable success catching Peacock bass. The best fish that I have hooked on a hybrid fly so far is an 80 cm kingfish that savaged the 5 cm Squid Vicious fly as it cruised within 6 metres of where I was hiding. The fish cruised past, I dropped the fly slightly ahead and to the right and it smacked it ferociously without hesitation. This just goes to prove that big fish are opportunists and will take small flies readily when they are presented properly. My two most successful hybrid flies are shown below along with the patterns. With this sort of fly you are only limited by your imagination. Body sleeve: Pearl E-Z Mylar tube Medium cut to length of hook shank. UV epoxy the top of the tube and allow it to soak in before setting with UV torch. Apply several coats to get a smooth case on the top of the fly. Also apply a stripe of UV epoxy to the rear of the tube to prevent fraying of the Mylar during use. Hook: Daiichi 2546 saltwater or equivalent. Size 1/0. Body Sleeve: Pearl E-Z Mylar tube Medium cut to 3/4 of the length of hook shank. Alternatively Hends Luminous EZ body tubing white. Code EZL01. Are those Singapore anglers you are refering to the Lure Haven team? Not sure. Alan Ang and the guys on the BFS Facebook page are the main users and innovators. Cheers, Alan.